"We spend billions of dollars trying to understand the origins of the universe, while we still don't understand the conditions for a stable society, a functioning economy, or peace." It sounds paradoxical, but today it appears that we understand more about the universe than our society. We have created systems, that have outgrown our capacity to genuinely understand and control them. Just think about the Internet or the financial markets. On the one hand, we are drowning in data. In 2007 Wired magazine heralded the arrival of the "Petabyte Age", plagued by the data deluge. Endless streams of data are continually flowing along global information super-highways, being stored in countless server farms around the world. On the other hand, while data can be mined and its potential harnessed, the biggest obstacle in understanding our own constructed socio-economic world has been nearly invisible. It came in the guise of a weltanschauung and is being currently conquered by a paradigm shift in understanding. Our traditional ways of thinking and problem solving have been strongly shaped by the success of the reductionist approach taken in science. The fabric of the universe is broken down into its constituents, who's interactions are described by four fundamental forces. Information is boiled down to an irreducible physical entity: the bit. This thinking has been at the heart of the Scientific Revolution and the dawning of the Information Age, unlocking spectacular technological prowess. Put in the simplest terms, the focus has been on "things". Tangible, tractable and malleable. Not so long ago, it was realized that there is an other, a more subtle dimension to our reality: things are not isolated! Ideas like interconnection, co-dependence and collective dynamics entered the stage. Indeed, this is the aspect of our world that has changed most in the past decades. While the things themselves still look pretty much the same, they have become highly networked and interdependent. The tools to grapple with this new era come from the field loosely known as complexity science. "At each stage [of complexity] entirely new laws, concepts, and generalizations are necessary [. . .]. Psychology is not applied biology, nor is biology applied chemistry." Understanding a systems components' individual properties does not bring insights into how the system will behave as a whole. Indeed, the very concept of emergence fundamentally challenges our knowledge of complex systems: self-organization allows for novel properties to emerge, features not previously observed in the system or its components. The whole is literally more than the sum of its parts. Although the paradigm shift, moving away from reducing to components towards analyzing interactions, seems to entail hopelessly complicated systems, it is a notable fact that also complex systems are characterized by laws and regularities. Most prominent are scaling-law distributions, also called power laws. Like a normal distribution, it quantifies what the frequency of an observed trait in a population is. Scaling-law distributions have been observed in an extraordinary wide range of complex systems: from physics, biology, earth and planetary sciences, computer science, demography and finance to the social sciences. In a nutshell, a scaling law says: most components are unimportant, very few are very important. Regarding economics, already in 1897 V. Pareto observed that household income is distributed according to a scaling law. Called the Pareto principle, or the 80-20 rule, this still holds today. The aphorism introduced at the end of the last paragraph has a whole new quality, now that it describes the realm of human affairs: nearly all have very little and very few have very much. Suddenly a general organizing principle of reality has an unjust and undemocratic feel to it. A recent example uncovering the patterns in an economic system, raising the issues of concentrated power, systemic risk and market competition, is the study: The Network of Global Corporate Control . Complex systems find a natural formal representation as networks, where the links describe the interaction structures. The study of complex networks has been extremely fruitful in the past decade and has uncovered many features of the physical, biological and social worlds. This is quite remarkable, as complex systems are usually very hard to understand employing mathematical equations, i.e., applying the standard scientific approach. In the study, ownership data of 30 million economic agents (i.e., natural persons, foundations, government agencies, listed and unlisted companies, etc.) from early 2007, located in 194 countries, was analyzed. By focusing on the 43,000 transnational corporations (TNCs) in the sample, a network was constructed with 600,000 nodes and 1,000,000 links (all numbers are approximations). Already the topological structure of this ownership network reveals a surprising organizational structure. Whereas 64% of the TNCs are distributed among many small isolated clusters of a few nodes, the remaining 36% are located in a single giant connected network of 460,000 nodes. Interestingly, this minority of TNCs accounts for 94% of the total operating revenue of all TNCs. 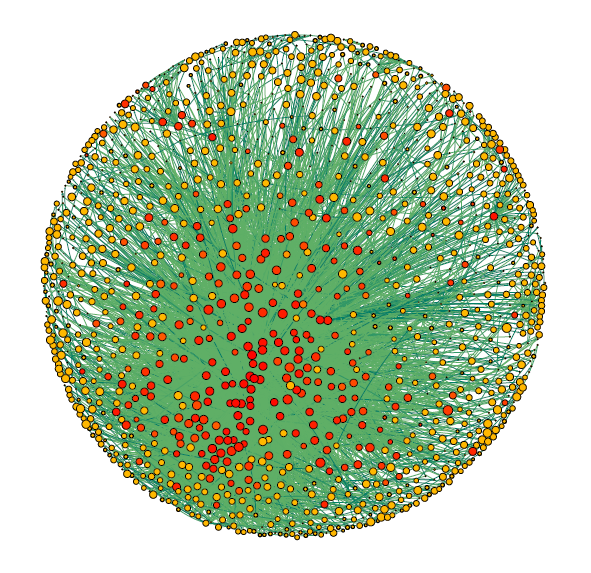 Moreover, the 460,000-node network has a tiny but distinct core of 1,300 nodes, seen in Figure 1. By introducing a methodology that estimates the potential degree of control resulting from a network of ownership relations, it is possible to identify the most important nodes. It turns out that 730 top shareholders are able to control 80% of the operating revenue of all TNCs. 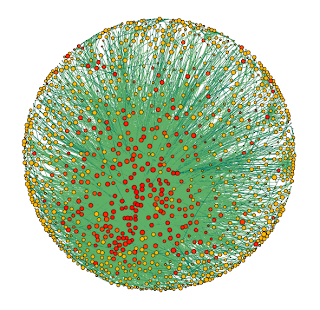 Furthermore, combining the knowledge of the topology with the ranking of shareholders, it is revealed that the 1,300 nodes in the core are comprised of the most powerful nodes in the network: the top economic agents are interconnected and do not carry out their business in isolation (a small excerpt is given in Figure 2). Finally, the core is able to gain 39% of the potential control. Although these numbers show an unprecedented high level of concentration, simulations suggest that this could all be the result of the interaction rules in the system. Contrary to common intuition, it is not necessary to have a puppet-master behind the scenes, orchestrating such a large concentration of power for self-enrichment. Inequality can be an emergent property. It is also an interesting side note, that the complex systems paradigm, with its empirical and data-driven foundation, its interaction-based methodology, is only very slowly being adopted in economics and finance. These observations could possibly have very important implications for the global economy. The observed organizational patterns could endanger market competition and financial stability. "Too connected to fail" being the next predicament our economy faces. However, in order to validate these concerns an additional interdisciplinary effort is required. This is the current state of things in dealing with socio-economic systems. We can improve our understand of their organizing principles, highlight potential weaknesses and looming threats. But to give concrete advice and formulate effective policies is a whole different story. Ambitious, long-term and highly-funded programs like futurICT (an EU FET Flagship Initiative), the UN's GlobalPulse or the US' Big Data R&D Initiative are currently trying to close this knowledge gap. The efforts aim at crafting new technologies and innovations building on a complex systems point of view, but are still at the level of data collection or project formulation. Ideas relating to economics, finance, politics and society are very often tainted by individual ideologies. In contrast, decoding the complexity of our world by considering its interconnected and interactive nature, not only brings novel understanding, but perhaps also allows for a neutral perspective to emerge in the not too distant future. Reality is so complex, we need to move away from dogma. James B. Glattfelder holds a M.Sc. in theoretical physics and a Ph.D. in the study of complex systems, both from the Swiss Federal Institute of Technology. He co-authored the study "The Network of Global Corporate Control" which was recently covered in dozens of news media world-wide and sparked controversial discussions. He is a senior researcher at Olsen Ltd, a quantitative FX investment manager in Zurich, focusing on market-stabilizing algorithms. His interests include the philosophy of science next to societal issues. You can follow him here http://twitter.com/jnode and here http://gplus.to/jnode, and read his blog here http://j-node.blogspot.com/.